What I liked best was not merely seeing the queen, as special as that was, but seeing an elderly man standing next to me—he was easily in his eighties. He was wearing his old army uniform, which was now too big for him on his shrunken frame. Maybe he was a veteran of World War I? Who knows? But he stood there, at attention, saluting the queen as she passed by. There was a tear in his eye. And I think—I hope—she saw him. It was so… sweet. So moving! While I watched this parade that day it made me wonder what it would be like to be subject to a queen or a king. But the truth is, as our scripture today reminds us, we who are Christians do live under a king—which we acknowledge when we pray in the Lord’s Prayer, “Thy kingdom come,” or your kingdom come. Actually, there are two closely related petitions, which, even when we recite the Lord’s Prayer we say without pausing, “Thy kingdom come, thy will be done on earth as it is in heaven.” But they’re meant to go together. Luke’s gospel includes a version of the Lord’s Prayer that Jesus taught his disciples on a different occasion. In that version, Jesus says “your kingdom come” without adding the words, “your will be done on earth as it is in heaven.” Bible scholars believe that the words “your will be done on earth as in heaven” help explain what we mean when we pray for God’s kingdom to come. When God’s kingdom comes in all its fullness at the end of history, on the other side of the Second Coming, it will mean that God’s will will be done on earth as in heaven. But also, whenever we see God’s will being done on earth as in heaven, we can be sure that God’s kingdom is breaking into our present world, like a ray of sunlight breaking through the dark clouds. The point is, God’s kingdom isn’t only something we have to wait for on the other side of the eternity. There’s also a sense in which God’s kingdom comes into our world right now. This is what theologians mean when they talk about the two senses of God’s kingdom: the already and the not yet. My sermon today is going to focus on the sense in which God’s kingdom is already here. 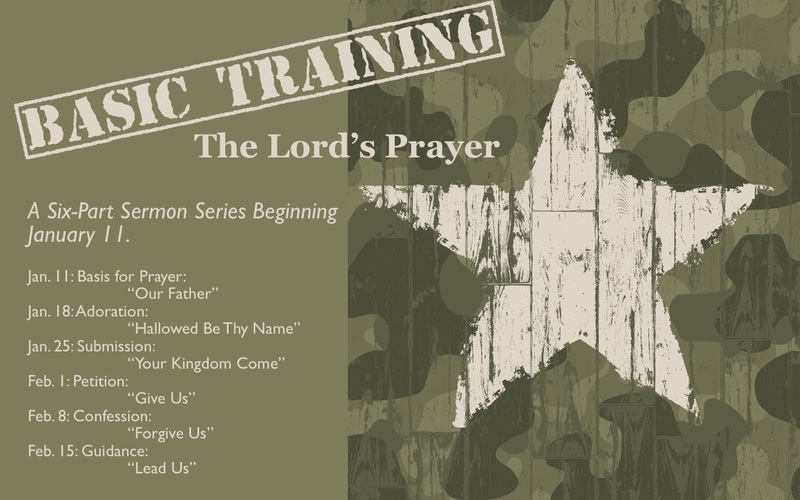 What does it mean for us right now when we pray, “Thy kingdom come”? The most important thing it means is that God is in control of our world. Because notice what we’re praying for: we’re praying that God will bring his kingdom to earth and that God will accomplish his will. Notice what we’re not praying for: We’re not praying, “God, what do we need to do to in order to bring your kingdom to earth?” We’re not even praying, “God, what do we need to do to accomplish your will here on earth?” When we pray “your kingdom come, your will be done,” we’re expressing our confidence and trust that God will make sure these things happen. Now, that doesn’t mean that God doesn’t also use us to accomplish his will. That doesn’t mean we won’t have important work to do for God’s kingdom. By all means! But God will make it all work out because God is in control. In saying that God is in control, I’m well aware of the risks of being misunderstood when I say it. Just this morning the headlines read that Islamic State militants killed one of two Japanese hostages they were holding for ransom. When we hear about things like this, we may wonder in what sense God is in control? When those two Islamic terrorists in Paris stormed into the Charlie Hebdo offices in Paris last week and gunned down twelve people, we may wonder in what sense God is in control? When a tsunami wiped out 200 thousand in the Indian Ocean in 2005, we may wonder in what sense God is in control? The world seems so out of control at times, yet the Bible, including Jesus himself, loudly proclaims that God is in control—of everything. To which I say, “I’m not going there, either!” Just because God permits something bad to happen doesn’t mean that that bad thing is really good. It’s bad. But there’s a difference between permitting and causing. God may permit evil or suffering to take place because even though that event is evil or bad, God knows that some greater good that will come out of it—or that, by allowing it, something worse would be prevented in the future. Only God can know that. We can’t. As one Christian apologist said, “Say you have a choice between either allowing one person to be shot and killed or three people to be shot and killed—you can’t do both. You can only prevent one. If you prevent the three people being shot and killed, [that means] you’ve permitted the one person to be killed.” But that’s better than the alternative. We can see an example of this in the story of Joseph in the Bible: Remember that Joseph is his father Jacob’s favorite son—by far. Jacob doesn’t make any effort to hide it, and Joseph’s brothers resent him for it. They’re jealous. They even plot to kill their brother before deciding, finally, to sell him into slavery instead. So Joseph becomes a slave in Egypt, and after a long series of twists and turns—which includes spending years in prison for a crime he didn’t commit—Joseph is set free and prospers, eventually becoming the Pharaoh’s most trusted advisor. In fact, under Joseph’s wise leadership, Egypt is saved from a terrible famine. [D]o not be distressed or angry with yourselves because you sold me here, for God sent me before you to preserve life… God sent me before you to preserve for you a remnant on earth, and to keep alive for you many survivors. So it was not you who sent me here, but God. “You meant it for evil—God meant it for good.” See, Joseph’s brothers thought they were in control when they sold their brother into slavery in Egypt. But no… As one pastor writes, “[T]here is something, someone, some deep, loving presence behind the story—some hand greater than the brothers’ guilt and evil deeds, some author greater than the actors.” Joseph’s brothers did some evil things, but nothing they did could prevent God from accomplishing his will and carrying out his plans—and bringing great good out of great evil and suffering. What are you afraid of in your life right now? Probably something, right? Whatever it is, say these words: What Satan intended for evil, God intended for good! Recently, I heard an amazing story on the public radio program This American Life. It was about a man named Daniel Kish, whose nickname is the Batman. Daniel is blind—he lost both his eyes to cancer when he was a baby. But from an early age, he learned to make clicking sounds with his mouth—and based on what he hears when he clicks, he could know what objects and obstacles are around him. It’s called “echolocation,” and it’s something that bats and dolphins do. And it might also be something that blind children would naturally do if they were allowed to. When Daniel was a kid, he learned to climb trees, cross busy intersections without assistance, and even ride a bike. To spend time with him today, you’d never know he was blind unless he told you. And he learned to do these things because, for whatever reason, his mother wasn’t afraid to let him get hurt—she wasn’t afraid of her child getting bumps, bruises, scrapes and even broken bones if these things helped him find his way in the world. As the reporter pointed out, most parents of blind children, unlike Daniel’s mom, are afraid to let their kids experience this pain; they want to protect their children from suffering. According to one blind man who uses echolocation to get around, this desire to protect their kids from suffering ends up hurting the kids. In fact, the reporter of the story kept saying that the parents’ love gets in the way of their blind child’s ability to overcome their disability. But I disagree. Maybe fear and ignorance get in the way, but not love. Because love doesn’t always mean protecting children from pain and suffering—not when pain and suffering would help us grow and become everything we’re capable of becoming. I say this as coward who never wants to experience pain in my life: But inasmuch as I have suffered in life—usually by bringing suffering upon myself by my poor and sinful choices—I know that suffering been good for me. It’s made me into the person that I am today. If anything had happened any differently, I would be a different person today. And I mostly like who I am today. And I like the person I’m becoming! Thank God! The point is, while I may not have chosen the path I took to get here, I’m glad I’m here now. Which proves to me that God really does know what he’s doing—and that I ought to trust him even when things get tough. You might have heard on the news this week about “Deflate-gate”? Or maybe the New England “Deflatriots”? The Patriots, who will be facing the Seattle Seahawks in next Sunday’s Super Bowl, were caught cheating—and not for the first time. The NFL discovered that in their last playoff game, the Patriots used footballs that were under-inflated. To use a ball that’s under-inflated gives the quarterback an unfair advantage in gripping and throwing the football. So everyone wants to know who’s responsible. Did the head coach, Bill Belichick, know they were cheating? Did the quarterback, Tom Brady, know they were cheating? Somebody in the organization knew. And the question a lot of people are asking is, Why? Why would they do this? Why would they be so afraid of losing? Why not trust that the team’s experience, their preparation, their talent, their hard work would be enough to lead them to victory? Why not trust that if they just followed the rules, they would be O.K.? And when we face a challenge we could ask a similar question of our faith in God: Why not trust… Why not trust that if we just follow our Lord Jesus and remain faithful to him, we’ll be O.K.? I’m thinking again of that old soldier who was saluting Queen Elizabeth when she passed by… What wouldn’t he do for his queen that he loved? What hardship wouldn’t he endure? Because he loved her? Because he believed in her? Because he trusted her. What wouldn’t we do for our King Jesus? What hardship wouldn’t we endure? Because we love and trust him? So, God, you want me to face this frightening disease with which I’ve just been diagnosed with courage? I’ll do it for you, my King. God, you want me to face this unemployment, this financial crisis with confidence? I’ll do it for you, my King. God, you want me to summon the strength to endure my mom’s death, my spouse’s death, my child’s death? I’ll do it for you, my King. Thy will be done. William Willimon and Stanley Hauerwas, Lord, Teach Us (Nashville: Abingdon, 1996), 63. This entry was posted on	February 5, 2015 at 3:27 pm	and is filed under Uncategorized. Two: This one may relate somewhat to a limit of my faith, or maybe not. Can God really make everything “personally” good for every believer all the time? I am thinking of the fact that there are ever-so-many billions of people on the earth, in all kinds of “conditions” (weather, geography, political systems, “wars and rumors of wars,” etc.). There are multiple billions of “interactions.” So, while God is “in control,” could it be that his “control” is in more of a “general sense,” as in, “basically designed for the good of Christendom in general for most of the time insofar as is possible”? And this is okay insofar as sometimes there may be some “injustices” as to this saint or another because God will “work it all out” with rewards and punishments and “reciprocity” come Judgment Day and the hereafter? Even if my concern no.2 has some legitimacy, I would still hold to two things. One: God certainly does at a minimum “intervene” as to individual believer’s lives from time to time for his purposes and their good. The example of Joseph is an excellent one. And I can point to some times in my life where I believe God “intervened.” But, as to Joseph, what about all the Egyptians who were affected? So, two: I totally trust that even if I am sometimes in a “what happens to the rest of us” category (assuming two above), I know God is “just” and will work all these things out perfectly in Heaven and Hell. In fact, I strenuously believe in “distinctions” in Heaven and Hell consequent to that conviction. Anyway, my thoughts. Tom, you and I are twin sons of different mothers. I have these thoughts myself, but I don’t think they contradict what I preach here. For one thing, part of being sanctified is learning to want what God wants—whether it personally benefits us in some way. If it’s good for God’s kingdom, then it’s good for us. But remember James 1:2-4. It’s hard to see how everything can’t be used for our personal good in some way.